47 Names of Various Pains | Troy C. Wagstaff aka CallahanWriter Blog: Topics of interest include Western Historical (1865-1899) Topics. Additionally inspirational Christian and Fibromyalgia interests. 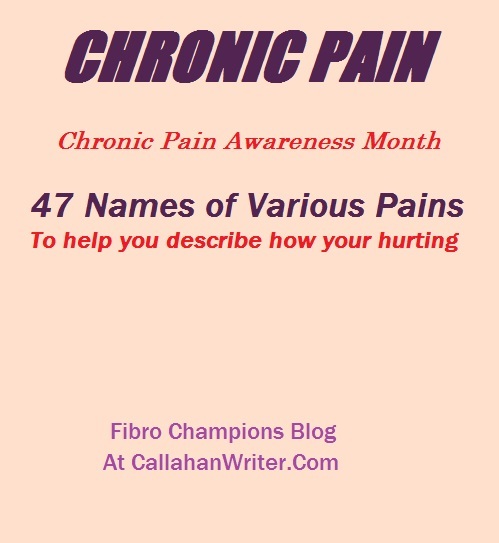 In honor of Chronic Pain Awareness Month, here are forty-seven terms that identify various types of pain. Wether you have fibromyalgia with fibro fog that makes it hard to think of words, or whether you have other types of chronic pain where the pain so debilitating you can hardly think, here are some terms that you can use to describe when seeking medical attention. I wish I had this list when I first started seeking medical attention eleven years ago.